SINCE the News & Mail reported earlier in the year how interest in a pair of magnificent men and their flying machine had been taking off, demand for the eagle-eyed entrepreneurs has been even higher. 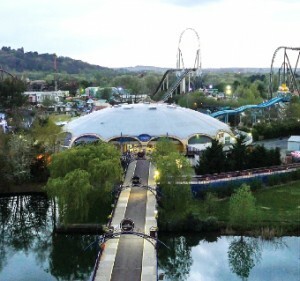 Dan James and Tomas Valigura, the team behind Elevate Studio, have recently applied their superb aerial photography and expert drone-handling skills to a commission at Thorpe Park. Having previously worked with estate agents, hotels, sports clubs, charities, local authorities and much more, they teamed up with Leor Video Productions in their latest venture to capture mesmerising results of the popular park. After vigorous health and safety planning, Elevate were given clearance to fly their drone among the rides and guests. 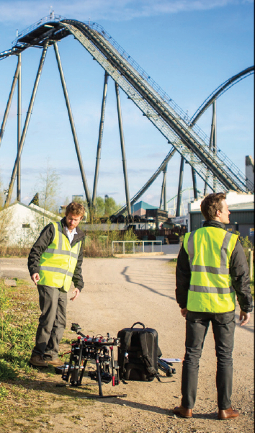 This marked the first time authorised drone pilots in the UK have filmed a theme park on this scale. Elevate captured the graceful complexity of the spiralling rides, especially the impressive main attractions: Stealth, The Swarm and Nemesis Inferno. Using a drone-mounted camera while the operator remains on the ground means he can remote control the machine while checking the images as they are being filmed. Lead drone pilot Dan explained: “This gives much more refined results than from a helicopter, while it’s a lot cheaper and safer, too. For Thorpe Park, we had a short window of time to get the filming we needed. 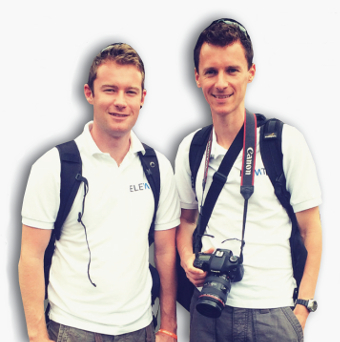 VISIT www.elevatecam.com to find out more and watch their films.